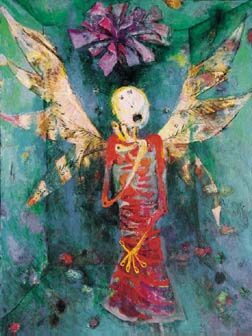 Many of Rasim Babayev's paintings seem like they belong in a fairy-tale collection designed to trigger nightmares. He's known for drawing many-fingered, many-legged and many-headed horned monsters baring several sets of teeth, which threaten tiny, helpless humans. The white teeth stand out in stark contrast against dark purples, blues and splashes of crimson. But these monsters, known as "Divs" ("devils" in Azerbaijani fairy tales), are not just imaginary. According to Rasim, they symbolize totalitarianism, specifically the terror of the Soviet system. 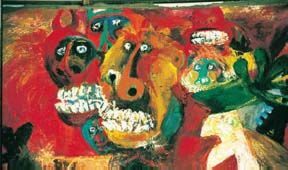 Despite the ban on any artistic expression that did not reflect "Social Realism", Rasim managed to get away with depicting them on his canvases under the guise of "Primitivism". In a recent interview with our staff, he described the circumstances that led him to paint Divs, and now to even include angels on his canvases, as Azerbaijan begins its journey towards independence. I began studying in Moscow's Art Institute in 1949. When I was a third-year student, I made a painting of my brother and a few of his friends down by the sea. There was much that was different about that work. The colors were not conventional; also, the body lines of my figures were not realistic. When I presented the painting to the Institute's Committee, they looked at it but wouldn't give me a grade for it. Later, the secretary came and asked me to pay a visit to Rector Madorov's office. When I did, I found several other professors gathered in his study as well. They reproached me: "What have you done, Babayev? This is not what we call art. Why have you gone down the wrong path? You studied so well your first year. You were an excellent student-what has happened to you?" One of the professors asked me: "Where could you possibly have seen a sea that was this color?" I replied, "I wonder if you've ever seen our sea?" He said that yes, he had been to Baku and yes, he had seen the Caspian Sea. I told him, "But you haven't looked at our sea with my eyes. If a hundred men describe a certain object, each one will describe it in his own way." I was asked to leave the room and wait out in the corridor while they continued discussing my work. Then Professor Nevejny came out of the study and tried to console me: "Take it easy-things like this happen. I know that the 1930s have had a negative influence on you [referring to the Stalinist repression] and now you are being influenced by the West. You'll soon get over it and forget about all these things." They were about to throw me out of the university. For some reason, they didn't. After that incident, the professors picked on me. Once the Rector told me, "You can't paint. You just spread the colors around and don't actually show what you are trying to represent." When I was due to graduate, the Committee refused to give me my diploma because they didn't like my final project, a painting called "Fishermen." I had painted the fisheries I had seen in Salyan [a region in Azerbaijan located on the northern coast of the Caspian Sea]. They looked at the work and said that they couldn't accept it because the people looked like Americans, not Soviets. I told them that I had never been to America or laid eyes on an American except in a few American movies. I was supposed to get my diploma the following day, but they refused to give it to me. In 1964, an Artists' All-Union Congress was held here in Baku. When I ran into the Institute's Rector who had come from Moscow, he paused and told me, "If my memory serves me right, you have yet to receive your diploma." I admitted that he was right - no, I didn't have my diploma. By that time I had become an official member not only of the Artists' Union in Azerbaijan but of the Artists' Union of the USSR as well, so he suggested that I go and pick up my diploma. But I told him: "You can keep my diploma. I give it to you. I don't need it anymore." And I didn't. When I first started studying art, I didn't understand the deficiencies of the Soviet system. It was as if I was wandering in a daze. In 1950, as a first-year student in Moscow, I visited the Pushkin Fine Arts Museum nearly every day. There the works of world-renowned artists such as Rembrandt, Gustave Courbet, Michelangelo and Rafael inspired me tremendously. Of course, many of the works were copies, although there were some originals as well. Still, it was a revelation to me to see them. But later that year a very strange thing happened: the museum was closed in preparation for Stalin's 70th Jubilee [birthday celebration]. The museum's art was replaced by an exhibition displaying the personal gifts that Stalin had received. This absurdity angered me and I trace my awakening and the beginnings of my protests against the Soviet system to that event. After I left the university, I worked in Moscow for a year, but soon realizing that Moscow was not the right place for me, I returned to Baku. During the 20th century, Azerbaijani art has been influenced by various schools of art. At the beginning of this century, two German artists came to Baku - Otto Schmerling and Rotter. They did graphics plus a lot of other work for Molla Nasraddin, a magazine of political satire [1906-1931]. Azim Azimzade, the man for whom the major art school in Baku is named, was also creating at the time. He was a great artist. I only had the chance to watch him draw once - it was on TV. His method was amazing. He drew one line, and then another. After two to three lines, an image appeared of a woman wearing a chador [veil]. Even though Azimzade never received any special training, he was considered one of the founders of formal painting in Azerbaijan. 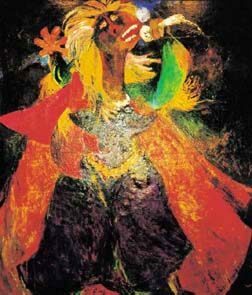 Rasim Babayev, "The Opera Singer", 82.5" x 73.5", oil on canvas, 1953. Courtesy: private collection of Farhad Azima of Kansas City. In the 1930s, an art college was established in Baku upon the initiative of Azim Azimzade. Its graduates included outstanding figures such as Tagi Tagiyev, Kamil Khanlarov, Boyukagha Mirzazade, Mikayil Abdullayev, Sattar Bahlulzade, Maral Rahmanzade, Vajiha Samadova and Rustam Mustafayev. Some of them continued their education at the Moscow Art Institute, for example, Bahlulzade, Rahmanzade, Abdullayev, Tagiyev, along with Baba Aliyev, Aliagha Mammadov, Yusif Agayev and Alakbar Rezaguliyev. (Some of them had their education interrupted because of the war.) At that time, famous artists such as Favorski, Istomin and Grabar taught there. In turn, the graduates from that Institute brought the traditions of Russian art to Azerbaijan. Mainly, art was developing in the direction of Social Realism. But there was still some influence from Russian avant-gardism. Russian avant-gardism was itself a very interesting phenomenon. I would not say that it emerged in the Russian culture naturally. It wasn't "cooked". It came as a revolution rather than evolving out of the culture. When I was in France visiting the Museum of Impressionist Art, I studied the trends in French art during the 18th and 19th centuries and realized that they were linked continuously in their development like a chain. There was a succession. In Russian art, it was more like an abrupt jump. Beginning in 1910, two Russian Maecenases - Shukin and Morozov - went to Europe and bought a lot of artwork by artists such as Modigliani, Picasso, Cézanne and Monet. The Russian school, including avant-garde artists such as Malevich and Kandinsky, was deeply influenced by these new trends. 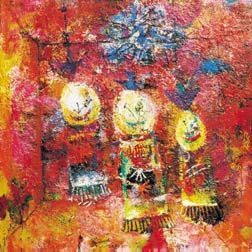 Rasim Babayev, "Refugees in their Home", 90 x 90 cm, oil on canvas, 1992. Note the artist's depiction of the refugees' isolation, anonymity and confinement in their new reduced status. The multiple feet on each figure reflect the literal translation of the word, "refugee"- which means "runner" in Azeri. The emergence of avant-gardism appeared suddenly in Azerbaijan's art just as it did in Russia. Artists representing avant-gardism were not consciously doing it-they just did it because they liked it. There was no philosophy behind their work. (Art with philosophy behind it didn't emerge in Azerbaijan until after the war.) This avant-garde trend was quickly transformed into Social Realism. My art education began in Baku in 1945 prior to my going to Moscow. Those of us artists who were against the system formed a group that included Ernest Neizvestny, Kalinovsky, Monashkina, Gorkhmaz Afandiyev, Tofig Javadov and his brother Javad Mirjavad. That was the beginning of our "dissidence". We all gathered around one single idea, it was the idea that we all disagreed with the Soviet school of art-that is, Social Realism. At the time, we were being trained by teachers who had been educated in Russian art schools. The characteristic feature of the Russian school was "draw what you see". There was a photo effect in all of the works. Plus the themes were almost always ideologically motivated: collective farms, Oil Rocks (the piers built out over the Caspian off Baku's shore to extract offshore oil), plants, factories, etc. Our generation did not agree with this ideology. It showed in our works, most of which were influenced by Cézanne. We deviated from the photo effect in both form and color. Another group of dissident artists returned from Moscow during the 1960s, which included Gorkhmaz Afandiyev, Nazim Rahmanov, Kamal Ahmad and Hamza Abdullayev. They returned to Baku during the period known as "the thaw"-Khrushchev's era, when there were not so many restrictions on artists as Stalin had imposed. These young artists came to Buzovna frequently. It was like they were being spiritually fed there. They made their living from orders by the government-doing placards and posters and such things-but that was just to earn money. I remember that it was during this time that Togrul Narimanbeyov began his creative works. After living in Buzovna for a while, I couldn't work with Javad and Tofig anymore because we disagreed so much about colors. I would say, "We have to put this color here," but Javad would say, "No, another." So in May 1958, I decided to head for Shaki, a charming town and one of Azerbaijan's most ancient communities. It's located in the foothills of the Caucasus, about a five-hour journey west of Baku. I was very impressed by the Shaki Khans' Palace there [built in 1762]; it became like a new art school for me. It was there that I got to know myself-I finally understood who I was, where I had come from and why. The Shaki Khans' Palace is a pure Azerbaijani school-there is Azeri philosophy inside it. I stayed there for six months. At the time, the palace was in very bad need of repair: it had no ceiling, the murals were spoiled and children were building fires inside the building. Later, it was repaired, but during my stay, I managed to copy nearly all of the murals. The primitivism in my works originates from there, from those medieval paintings. Then I returned to Baku and began working with Javad again. He was a close friend of mine, even though we quarreled from time to time. I had known him since childhood. Javad was a bit older than I was. We used to wander all around the city together. We walked all over the Absheron Peninsula from Gobustan to Sumgayit. As with many other artists, Absheron has deeply influenced my work. After that, the Div became a symbol of evil in my paintings-the symbol of dictatorship. This Div began to develop gradually; it became the many-headed Div, the many-handed Div, the many-legged Div and so on. The symbol of the Div appears again and again in fairy tales and folklore. This Div still appears in my work, since dictators still exist in the world today. What else do I paint besides Divs? In 1990, I had an operation and was kept under sedation during the procedure. While I was asleep, I dreamed of angels. Yes-two white, real angels. Now these angels appear in my work. When I compare the past and today, I can say that back then I could never have imagined that someday I would be painting angels. We used to be under so much pressure that I dedicated all my works to the collapse of the Soviet Empire. Today we have no such pressure. In the past, any works that were against government policy were never allowed to be exhibited. In 1976, I had a personal exhibition in Moscow. When I went to the area where the exhibition was to take place, I saw a man with dark glasses standing in front of my paintings, looking at them. I discovered that he was a KGB agent who had been sent to look at my works and decide which ones should be taken away. When I realized that the opening of my exhibition was deliberately being delayed, I asked what was wrong. I was told that there had been some confusion, and that someone from the Artists' Union would be contacting me. So a guy came over to me (by the way, I knew him well; he was a good art critic). He told me that I had to take away nine works including the ones entitled "Idiot," "Aggression," "Hysteria" and "Extremists". 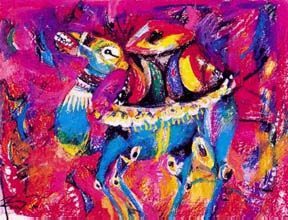 Rasim Babayev, "Camel", 59 x 84 cm, pastel on paper, 1989. Farhad Khalilov (now President of the Artists' Union in Azerbaijan) was there with me. He objected: "Oh, no, we won't take them away." (Farhad was also one of those against the system.) But I realized that unless I took them away, they wouldn't open the exhibition. So I complied. Before those works were taken away, I told the art official, "If the mighty Soviet state is afraid of these little works, then take them away." But he ignored my words. I had organized 40 works for the exhibition; nine of them were excluded. I used to wonder why so many artists immigrated to Paris, but then it became clear to me. It was because art was more independent there-far removed from politics. Politics doesn't oppress art there-something quite different from what we were experiencing. During the Soviet period, we had to rise against the system in order to make art independent from it. Today, art is free and independent. If someone is a genuine artist, he can take advantage of this freedom. Being an artist is like being a volcano, if you're able to erupt, then do it; if not, then keep silent. For more photos of Rasim's work, see "Rasim Babayev" [AI 3.1, Spring 1995], AI covers for 4.3 (Autumn 1996) and 6.2 (Summer 1998) as well as the illustrations in Vagif Samadoglu's article "The Sixties: A Roadmap to Independence" [AI 6.1, Spring 1998]. Rasim Babayev's studio is near the Hyatt Regency. He can be reached at Tel: (994-12) 38-47-82 (studio) or 38-22-87 (home).